One of the things I love most about being a children’s librarian is discovering books and authors I don’t know. 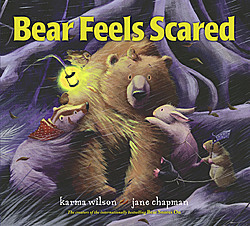 We just got in Bear Feels Scared, the newest book in British author Karma Wilson’s series about a friendly bear and his loyal friends. I’d never heard of these books before. Or rather, I’d seen them on the shelves of our storybook collection, but they are among countless books I am still reading and finding out about. And I loved Bear and his friends, so I grabbed the other books and read those, too. 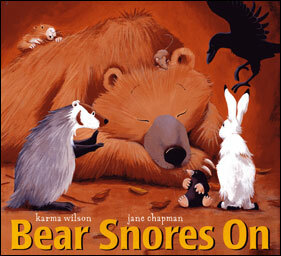 This is a really winning series, all illustrated by Jane Chapman, that would make great storytimes. They deal with feelings that kids can relate to, funny things that will make kids laugh out loud, and desires that kids share. The first book, Bear Snores On, introduces us to a hibernating bear and all the woodland creatures who sneak into his warm cave. He snores while they throw a winter party. The other books, Bear Wants More, Bear’s New Friend, Bear Feels Sick, and Bear Stays Up for Christmas, are all great. These may become one of my new go-to choices for emergency story time.